The reward for finishing this 5k is a hot toddy made with Jack Daniel's whiskey. The Jack Daniel's Hot Toddy 5k will return to Philly this winter. Registration for the Sunday, Dec. 3, race is now open. Once again, MANNA is the official race charity. The 3.1-mile race starts and finishes at Xfinity Live! and includes a loop around Citizens Bank Park and Wells Fargo Center. 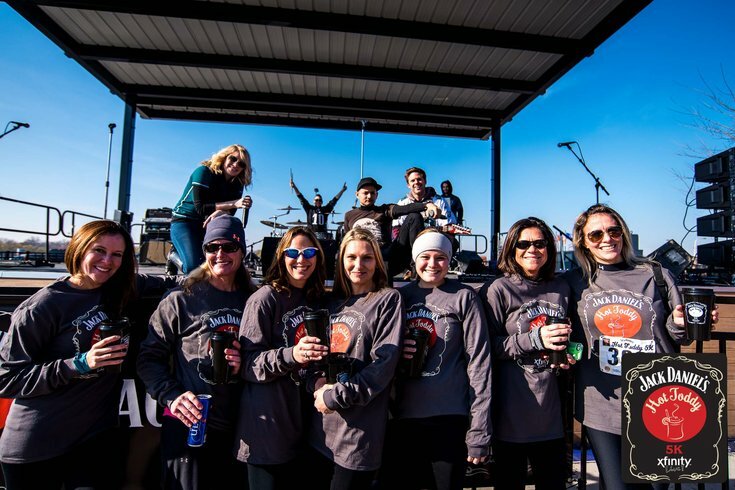 Participants receive an exclusive long-sleeved race shirt, insulated Jack Daniel's Hot Toddy 5k mug and one free hot toddy made with Jack Daniel's whiskey. Choose from Jack Daniel's Tennessee Fire, Jack Daniel's Tennessee Honey or Jack Daniel's Original No 7. Additional hot toddies (because it's hard to have just one) will be available for purchase. Show your bib at the post-race party in Xfinity Live! and receive exclusive drink specials. Before the race, there will be a free stretching session with SWEAT Fitness. And those who want to support MANNA further can help assemble fruit bags for those in need, after the race. Registration for 21-plus adults starts at $42 per person. The price will increase as the race gets closer. As for those age 5-20, there is an advantage to being under the legal drinking age. No hot toddies but you'll save money. Registration is only $35.